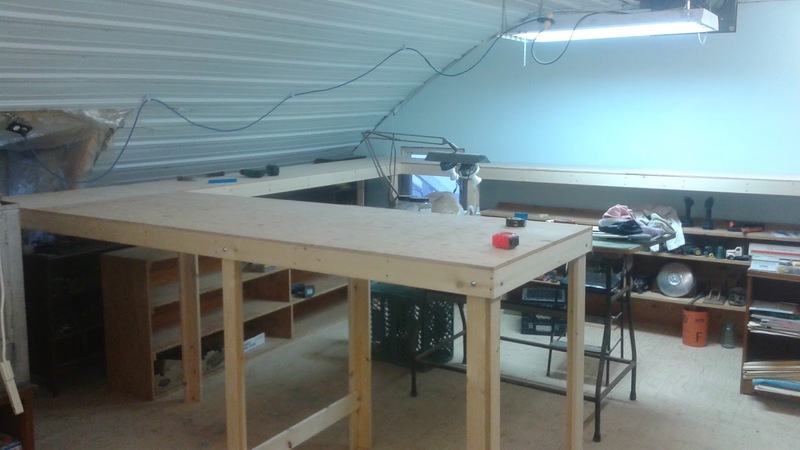 After reading and studying Lance Mindheim's thoughts on shelf and switching layouts, I have cobbled together a hybrid benchwork of sorts. 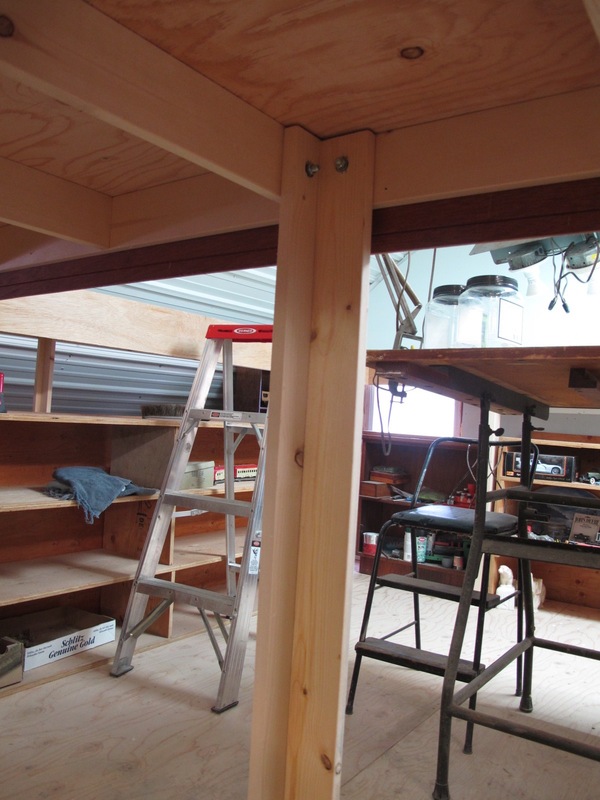 Incorporating a partial shelf layout and a freestanding peninsula. 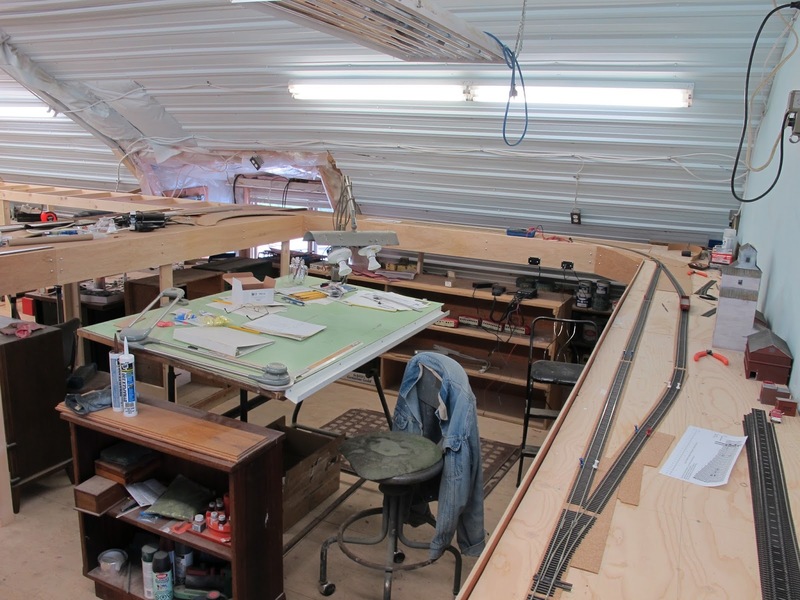 The Harte Siding layout resides in the hayloft of an old barn, now converted into a workshop. 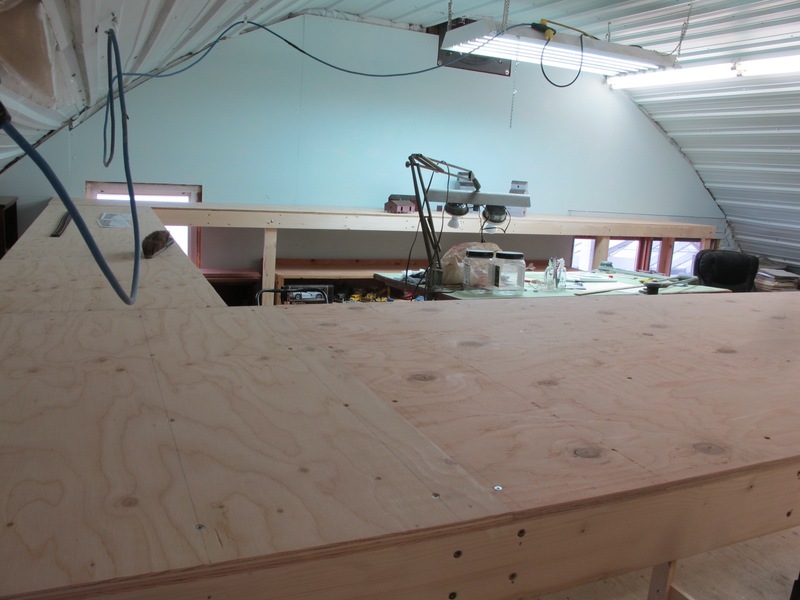 There is still some back and forth about final layout size, but at present it has an 18' x 46' footprint, incorporating a basic point to point railroad. 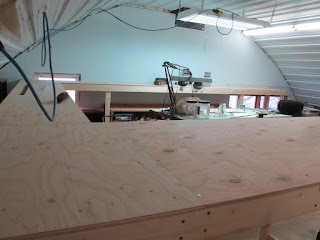 I have used SPF 1x4's, as straight as I can find, and then topping the open grid benchwork with 1/2" plywood. 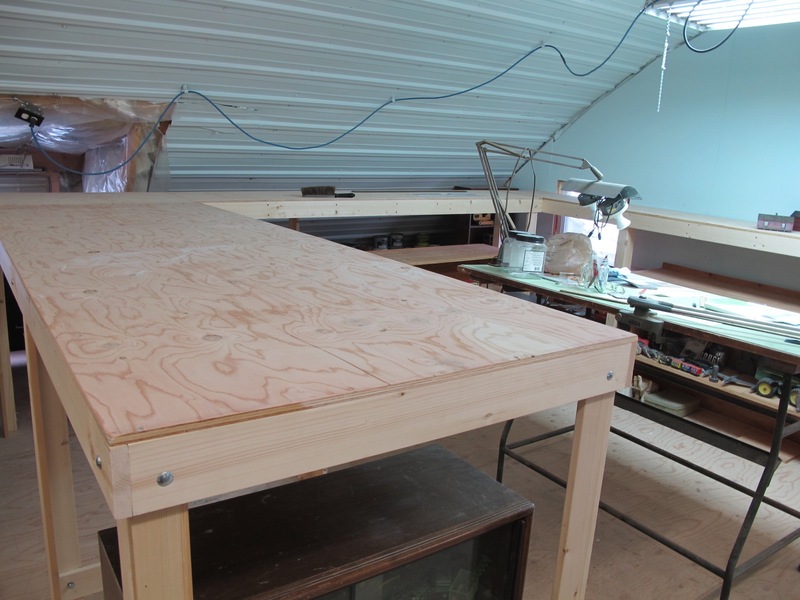 The open grid work is on 16" centres, glued and screwed with deck type screws. I have built it in a semi modular fashion, in 3 sections, that will allow for future expansion as desired. There is some discussion on the optimum height for the benchwork. Normal table top or counter height of 32" or so involves too much bending over, (back killer), and gives too much of a helicopter view of the layout. Closer to eye level is better for viewing, but too high and all but the tallest folks can't see it and makes for working on the layout almost as bad as too low. 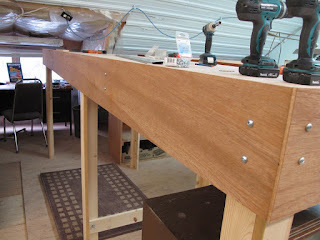 With all this in mind, I opted for a 48" to 50" height, depending on how much relief the scenery will have. Although flatland Manitoba, particularly Harte siding in Charleswood is table top flat. 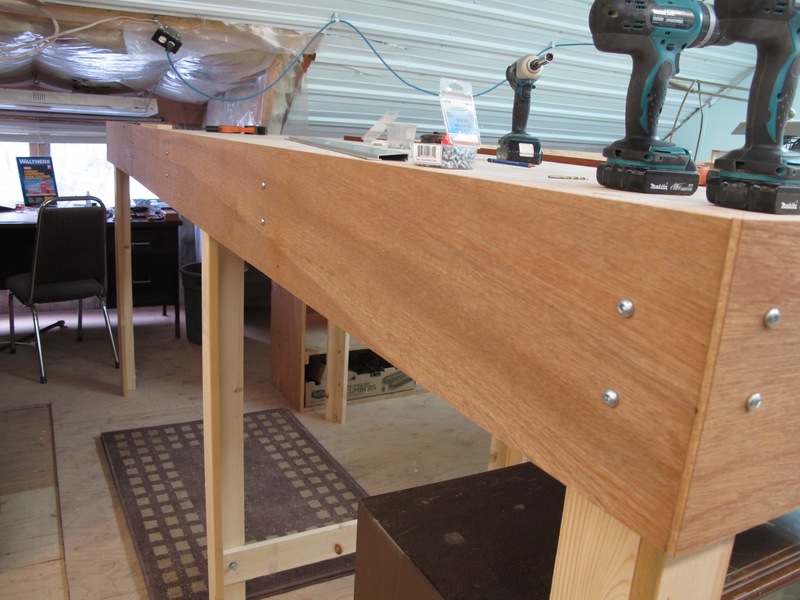 The bench legs were cut from 1x6's, ripped in half length wise and 48" long. The two halves were then laminated together with glue and air nailed with 2" brad nails. 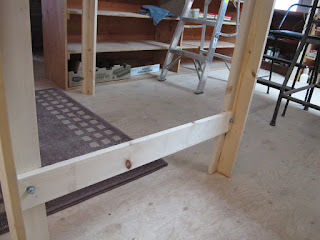 I then bolted the legs to the 1x4 frame work with 5/16" carriage bolts, for easy removal or adjustment. After I had installed the legs I got to toying with the idea of using T nuts on the bottom of the legs for minor adjustments. But that thought ended up being one of those, "close the barn door after the horses are out", thoughts. Didn't happen. Maybe later. Which of course brings to mind another truism...."There's never enough time to do it right the first time, but always enough time to do it over!" 1"x4" cross bracing for leg stability. Attachment point for laminated legs, with carriage bolts. 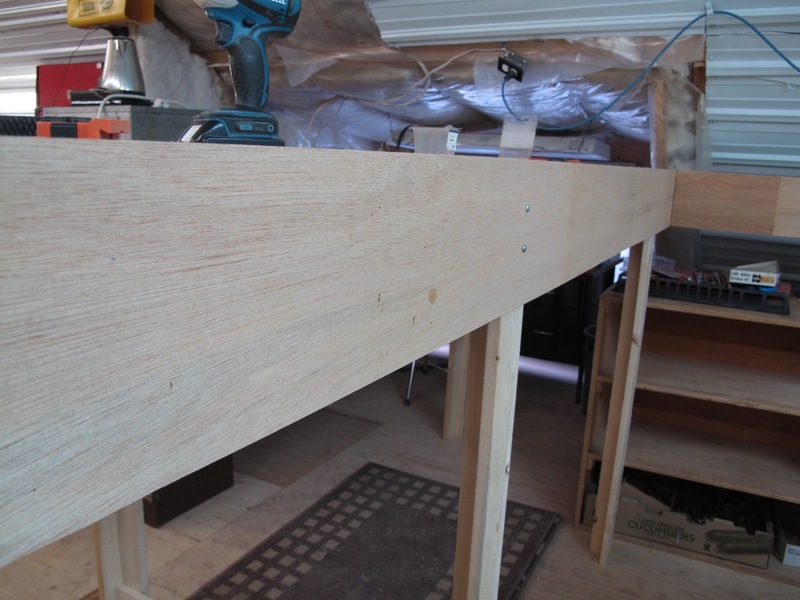 I then installed some 1/4" panelling ripped to 7" in width for the fascia, attaching same with some 3/4" pan head screws. Once I paint over the screw heads they will hardly be noticeable. 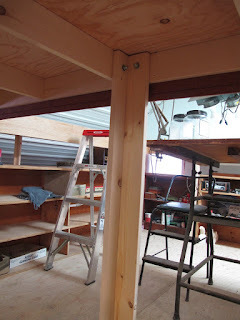 And with the screw attachment I can always remove the fascia to access the leg bolts or other under benchwork stuff. 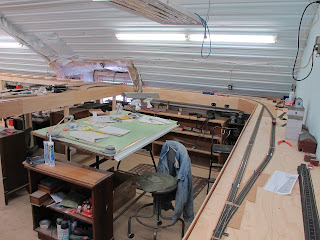 However with the 48" sub roadbed height, that still leaves plenty of room to work under said layout. Then paint same with a darker colour, possibly medium to dark green, so eye attention is focused on the layout and not the substructure and bench legs. 1/4"x7" fascia installed with 3/4"pan head screws. Another point regarding the fascia. I left a 3/4" lip above the plywood bench top. 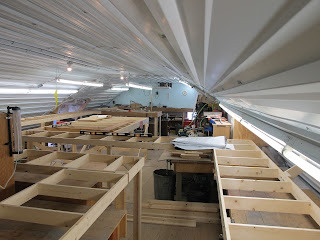 Some of the scenery and ground work may end up tapering into the fascia, but the other reason for mounting it high was to give an uncomfortable edge in case some folks feel they want to lean or rest on it. Found that little tidbit on one of the model railroad forums. Good thinking. Don't need folks using the layout as a convenient spot to rest their arms. Probably not a whole lot will be accomplished in the next couple of months, due to other summertime commitments. Once September rolls around, along with the cooler weather, I shall be moving ahead full throttle with track work.